All empaths have special and unique needs when it comes to protection. One thing they do have in common is finding a way to block the energy and emotions of others that can overwhelm them. Wearing crystals and stones in jewelry, or carried in a pocket or bag, is one way to accomplish this in a time honoured fashion. Below is a list of 14 such crystals that can aid the empath in dulling down some of that negative or unwanted energy from others. Amethyst can be worn to prevent psychic attacks and to protect the wearer from all types of harm. 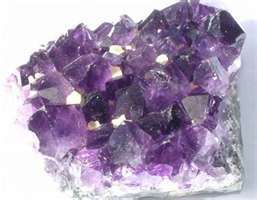 Keeping an amethyst cluster in a room such as the living room, will clear out negative or blocked energies. Inexpensive, this stone does work and can be found in rings and pendants for easy wearing. Amber A tree resin rather than a stone, amber has been worn for thousands of years to bring luck and protection to the wearer. It does work wonders when warding off negative energy or attacks from others, but also works very well to relieve depression and lift spirits, especially during gloomy weather. A very bright, uplifting stone. Fire Agate offers a strong shield of protection. It is a stone that transmutes energy and is excellent for dispelling fear. All types of agate are useful for protection. Hematite is aligned with the base chakra and is therefore grounding. It is very protective and can prevent the wearer from absorbing the negativity projected from others. Yellow Jasper can be worn during travel as a shield, known as a travel stone, it is also a uplifting. May be used to block nuisance energy and create a quiet shield around oneself. Kunzite is a protective stone that can ward away negative energies. This stone is so useful as it also works with the heart and is a powerful stone of love and higher vibrations. Labradorite is one of the best stones for protecting against energy coming from other people. It efficiently deflects undesirable energies, preventing psychic vampirism as well as spirit possession / influence. It creates a shield within our aura. Lapis Lazuli is said to guard the wearer or carrier against negative psychic emanations whilst helping us to speak our mind. 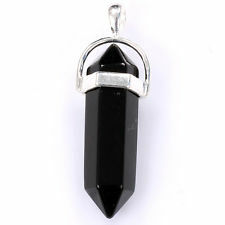 Obsidian is one of the strongest protection stones and can shield us from psychic attack and is also said to be a shield from emotional and physical attack. It will seek to purify negative energy in its vicinity, also within the aura, making this a very useful stone. This stone can bring out dark energy from within to heal, and as such is also a healing stone that can even work to remove shock or trauma from a person. Could be used to protect against negative entities. Black Onyx blocks negative energies from entering and can help prevent psychic drainage from the aura. A very strong protection stone that assists with personal grounding. Clear Quartz is protective and can transform negative energy to positive. It enhances the aura significantly and amplifies this aura or any healing coming from it. It can raise the vibration of personal energy also, it may even provide protection for an entire home. Black Sapphire is a stone of protection that can be found in fine jewelry. Tigers Eye is a stone of protection and also abundance. It is said to be able to ward of the evil eye. Black Tourmaline is one of the most powerful protectors (some say THE most powerful) against the negative energy from others in both the earth and the spirit plane, and so is a good crystal to keep next to your bed at night. Keep a piece at your place of work, in a drawer. It is said to reflect negative energy back to the sender. It is also good for deflecting away radiation from electrical equipment, so maybe you want to keep in on your desk if using a computer.